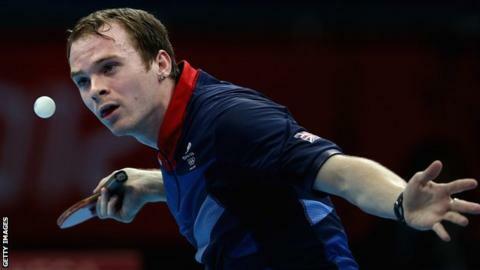 England's men secured promotion to the top tier of of the World Team Table Tennis Championships for the first time in 17 years with victory over Slovakia in Tokyo. Paul Drinkhall sealed a 3-2 win in the semi-final to seal promotion from Division Two. Liam Pitchford won twice before British number one Drinkhall beat Thomas Keinath 3-0 in the deciding game. England, ranked 23rd in the world, face Italy in Sunday's Division Two final. Promotion means they will compete in the top division of the 2016 World Team Championships in Kuala Lumpur for the first time since the event was held in Manchester in 1997. "It's been a great team performance," said Drinkhall, 18, whose triumph at the Spanish Open in April was the first by an Englishman at world level since 1996. "We are happy to go to the first division but we've still got another match tomorrow and hopefully we can come out as winners." England women's hopes of promotion to the Championship division were ended by a 3-1 defeat to Lithuania.